There are so many times these days when I just want to get off this mad conveyor-belt of constant action, and be back in the wilds, away from phones, the internet and all the trappings of 21st-century life as it becomes more and more dehumanised. Being amongst wildlife and the mountain peoples is a great pleasure, and one of the marvellous aspects of being an artist is that your paintings and sketches recall so many wonderful moments in these places. This scene shows a group of buffalo, wary of the intruders to their patch in the Gol Mountains of Tanzania. I’d just been sketching the frenetic activities of a gaggle of Nubian vultures gorging themselves on a carcass. These were days of constant excitement amidst outstanding scenery. In this watercolour I broke up the skyline with wreaths of mist as it tended to intrude right across the composition. 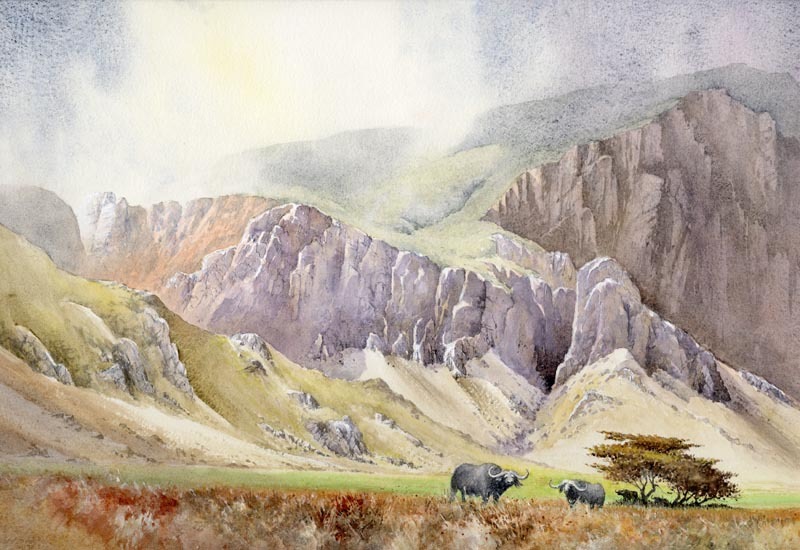 The cliffs have been rendered with Daniel Smith Watercolour Ground, which is similar to Gesso, but easily painted over with watercolours. This was applied with a painting knife and injects strong texture into this large work. There are still a few vacancies on my course at St Davids in Pembrokeshire from 2nd to 7th June. It takes place at the superb Warpool Court Hotel overlooking St Brides Bay, and we have such an outstanding wealth and variety of painting subjects both on the coast and inland, not to mention the amazing display of flowers along the coast path and hedgerows. Enjoy your painting and don’t forget to get off that mad conveyor-belt every now and then to recharge your batteries! This entry was posted in Adventures with wildlife, Animals in landscape painting, Daniel Smith Watercolours, David Bellamy, sketching, sketching animals and tagged #danielsmithwatercolours, #davidbellamywatercolours, #paintinganimals, #watercolourinthewild by David Bellamy. Bookmark the permalink. Lovely painting. Any chance you should be in Italy or Chamonix? Thank you for your kind comment. I have no immediate plans to go to Italy of Chamonix, but I am in Italy almost every year at some stage. I have a painting holiday in Austria in September, which you can see on my website. You certainly deserve a break, after all that is what we, students enjoy when we attend your courses. So Enjoynit, you deserve a break.This is what we, your students get and need when we come on your courses.So just enjoy, soak up the scenery, which MAY give you ideas of a future subject. Looking forward to your next pAinting sometime. Just remember there are a number. Of us, who greatly enjoy your own work, which gives us the ideas and confidence to produce our own, hopefully. With my best of wishes, and enjoy your own brilliant talent. Sincerely, Diana Crosser. Thank you Diana – Best wishes with your painting! I too have found myself taking a painting break during this winter due to life’s pressures and commitments and unfortunately this leaves me feeling dissatisfied and restless. Merely gazing at your beautiful painting of the Gol Mountains is inspiration itself. I have purchased some Daniel Smith’s Watercolour Ground some time ago and you have reminded me to get the lid off again and do some experimenting. If I was near Brecon I would surely be there like a shot to view your lovely work. Sadly Norfolk is some distance too far. All good wishes for the coming year. Thanks for your kind comments, Gill. There’s nothing quite like losing yourself in nature with a sketchbook, even if you have no particular project in mind, and some of my best sketches happen when I am just filling in time and not putting pressure on myself to produce the best possible work. Sadly I will not be able to attend your next course. Have had a dissapointing time recently.have had to give up driving, following a fall my back has taken a setback, even my hip replacement some years ago, has been affected. However I will be determined to potter round the garden, using a Rollator. Now I do have a challenge !z,! My grandaughter is getting married in April, so I have a goal to resume normal activities! The very best of wishes to you and your wife, Sincerely, Diana Crosser. Hi David. I live on Anglesey, but will do my best to be there. That’s quite a journey from Anglesey, Cathy, but the scenery is great! Do come and introduce yourself and I look forward to meeting you.